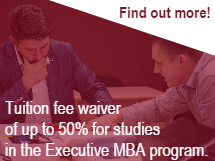 Professional MBA at Riga Business School entails a serious commitment of time and resources. For this reason, we suggest to you to gain a close - up view of the program and meet current participants, alumni, professors and staff members. If you are unable to attend any of Opened Day @ RBS, you can contact the Professional MBA program director for a personal interview and a personalized visit to RBS anytime. We will be happy to answer any questions you may have regarding the content and structure of the program and provide information on the admission procedure, as well as offer professional advice on your career. October 17, 2018, 6 p.m.